Had to share this video, production is excellent… if you like AE86’s you will like this ! Long Live The Eight-Six from BOWLS on Vimeo. It was with great sadness that I learnt of the death of Sean Mc Menamin a prominent and valued member of our site after a battle with illness. Sean (ae86_lad as he was known to most on here) was a member of AE86irl since 2007 and was one of the most honest, up front and passionate guys you were likely to meet. His contributions on here were always helpful and Sean could always be relied on to be quick witted! His illness was not known to many on the site and it is only now that we can look back and realise the courage he must have shown through this difficult time. I know he did mention to me that cars and AE86’s were a welcome distraction for him during treatment and I’m glad that we as a group were able to help in some small way with that. The last memory many of us will have is of Sean enjoying drifting his car at a trackday in Aghadowey just a few months ago and I think its a nice way to remember a friend who was a total AE86 fanatic. Here’s hoping there are lots of Nangkangs for you to burn up there…. Something we hate having to post here but a site member has had his white uk spec ae86 stolen from Killerig Golf Lodge at Tullow Carlow last night Monday 23rd. There is an extremely generous cash reward on offer for it’s safe return.. This is a well known car and we want to get it back to its rightful owner. 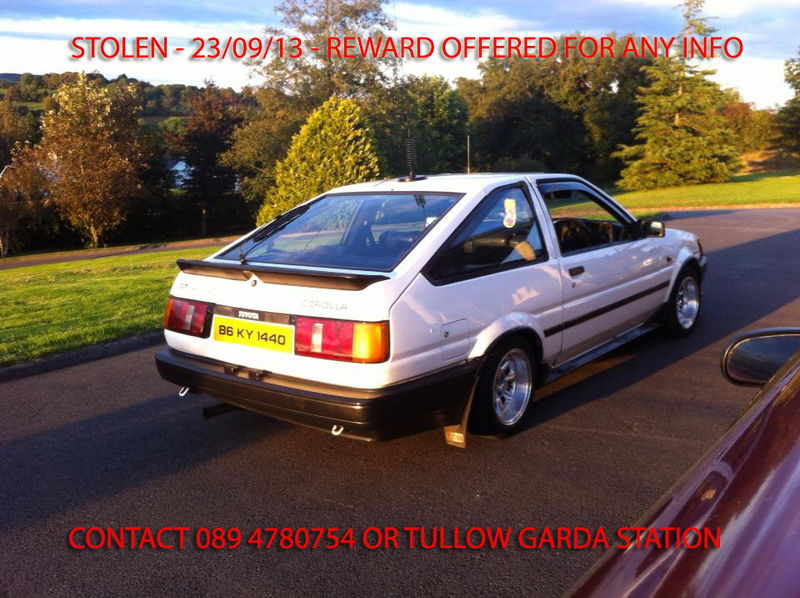 If you have seen this car or have any info which may lead to its return contact Darragh on 0894780754 or Tullow Gardai. 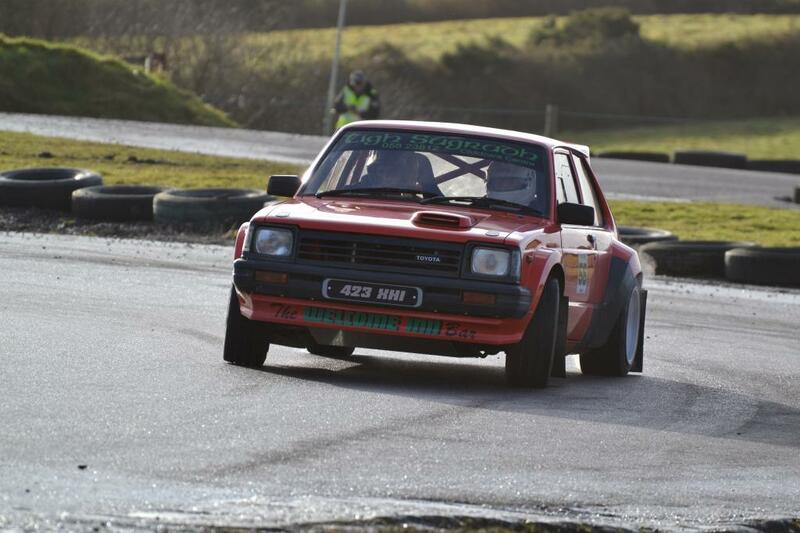 Just a quick note on behalf of AE86irl to extend our deepest sympathies to the family and friends of Paul Mulcahy who tragically lost his life following an accident at Ravens Rock rally. Although I never had the privilege of meeting Paul I know that he will go down in history as a huge talent, a spectacular entertainer and a true old skool Toyota fan. I would also like to wish Paul’s co-driver Kevin Power an AE86irl site member a full and speedy recovery. For those of us who like cars, and in particular those of us whose car cannot be replaced by simply hopping onto DoneDeal for 10 minutes the thoughts of having your car stolen is pretty much as gut wrenching as it gets. It is unimaginable how it must feel to know that your pride and joy which you have pumped countless hours of blood sweat and tears into, gone hungry to buy parts for and has given you so many good times can simply be taken by some scumbag without a moments thought. Mark a member of the AE86irl admin team had to suffer this and whats more he had to witness his AE86 go up in flames in a botched theft attempt at the hands of some jealous, mindless wastes of space who have accomplished nothing in their lives. 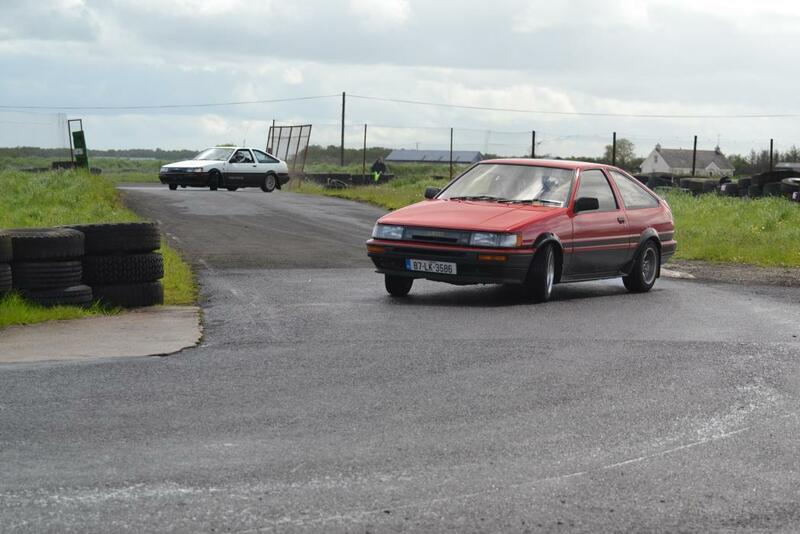 As a community AE86irl felt Marks pain and came together with the help of Seamie in Premier Performance Cars (who kindly provided a raffle prize) to contribute what we could and to show support and help in some small way towards his next project. If there is any good that can come out of something like this its perhaps further proof as to what a great community we have here, that even in times of recession people are willing to dig into their pockets to help another member out. And it may just be the trigger that some people need to beef up their security. Thanks again to all who donated to Mark and make sure to check out site traders www.premierperformancecars.co.uk for all your AE86 needs.